Barclays has been slapped with a record fine for trying to keep a huge deal with super rich clients so secret it bought a new safe just to store the documents. The U.K. Financial Conduct Authority fined Barclays £72 million ($109 million) on Thursday for trashing its own rules on making background checks on clients and the origin of their cash, and whether they figured on international sanctions lists. 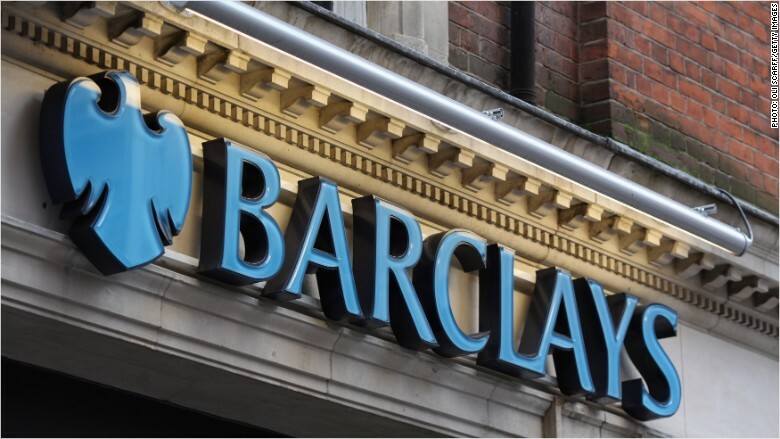 Barclays (BCS) said there was no evidence a crime had been committed, and that it "continues to apply significant resources and training to ensure compliance with all legal and regulatory requirements." But regulators said the lengths a handful of Barclays employees went to hide the £1.9 billion transaction ($2.8 billion), including from the bank's own staff, "threatened confidence in the U.K. financial system." The FCA said Barclays bent over backwards to accommodate a number of "ultra high net worth clients" and earn its £52 million commission. The bank had failed to perform proper due diligence that should have thrown up a number of red flags, the FCA said, adding it had tripled the size of the fine to act as a deterrent to others. Known as an "elephant deal" inside Barclays, the transaction took place in 2011-2012. One senior banker said it could be "the deal of the century," according to the regulators. Barclays would not comment on whether former CEO Bob Diamond, who resigned in July 2012 in the wake of the Libor rigging scandal, was aware of the deal. The bank would have faced an even heftier penalty had it not cooperated with investigators at an early stage. The FCA gave no details of the clients, or their countries of origin, but described them as "politically exposed people," which it defines as individuals outside the U.K. who may have been in a position to abuse their public position for private gain. When Barclays asked its clients about the origin of the money, it was told the cash came from landholdings, real estate and commercial activities. The FCA said this answer was "wholly inadequate and virtually meaningless." 1. Did not sufficiently corroborate the clients' stated source of wealth and source of funds for the transaction. 2. Omitted client names from internal systems, meaning the bank could not carry out crosschecks against international sanctions and court order lists. 3. Relied on public Internet pages to verify the clients' sources of wealth. 4. Rushed the deal through so quickly the bank had received the cash before it had any assurance as to the source of the funds. 5. Opened and closed offshore accounts quickly just to process this transaction. Perhaps most alarming are the steps the bankers took to keep the deal hidden from colleagues. Some of the documents related to the trade were held in hard copy by Barclays "in a safe purchased specifically for storing information relating to the business relationship." When regulators went to the bank to investigate, "few people within Barclays knew of the existence and location of the safe," the FCA said. Neither Barclays nor the FCA would comment on where the safe was located.